Looking to host a professional business meeting or a conference? MAK ALBANIA is the perfect venue to host your event! With a unique ballroom in Tirana, with a size of 1000 sqm, and a range of making the ballroom in three meeting rooms with different capacities, we promise you an unforgettable event accompanied by outstanding facilities and service you desire. Discover three charmingly decorated private rooms, the big advantage of the ballroom is that it has no pillars in the middle and has welcome design given by the wooden layers both on the walls and floor, magnificent ballroom in Tirana. A truly exclusive way to conduct a business meeting, private event or host an intimate wedding, the hotel, grounds and staff are all readily available to cater to your needs. The ILLYIRA Ballroom is our biggest venue with its 465 m2 and one of the most preferred event organization places in Tirana. It is ideal for gala dinners, weddings, large meetings or exclusive presentations. In fact, it can hold up to 380 people in a theater style and 280 in a gala dinner. In addition, an LCD projector and an automatic scrolling screen both mounted on the ceiling. This room is composed of two rooms IIIYRIA 1 and 2 separated by a movable wall. Designed to energize, indulge or comfort, the 465-sq.ft. 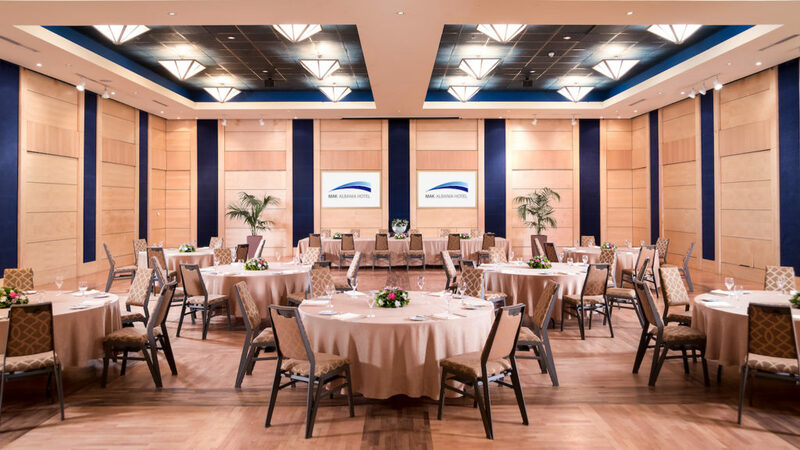 modern meeting space features flexible indoor space and includes a spectacular ballroom and 4 breakout rooms, able to accommodate from 10 up to 500 guests. Wherever you choose to gather, you always have the support of the audio and visual equipment and high-speed Internet access. Our enthusiastic staff and executive meeting specialists will efficiently look after all the details of your event so that you can focus on what truly matters: your guests. The elegant Illyria Ballroom and our open air terrace are the perfect spots to celebrate any event.